Since he and his sister had been playing with Legos all weekend and because they both love Legos, Scooby-Doo, and “scary things”, I did buy the movie. They watched it after dinner, homework, violin practice, and baths were all finished. 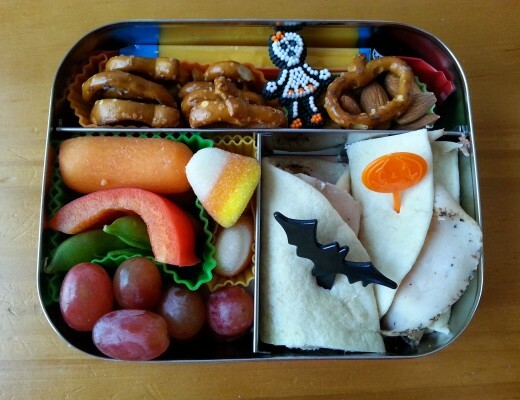 They enjoyed the movie and it inspired me to pack the lunches below. 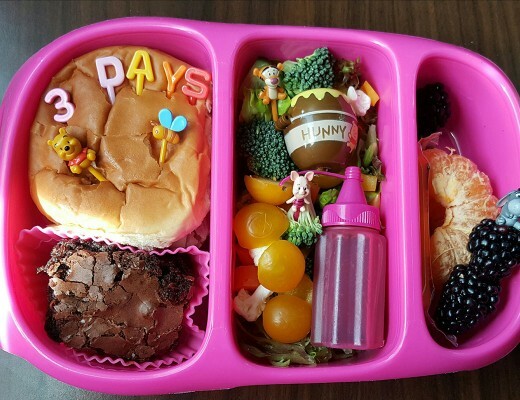 This lunch is for my daughter. It is packed in our red Lego block bento box. 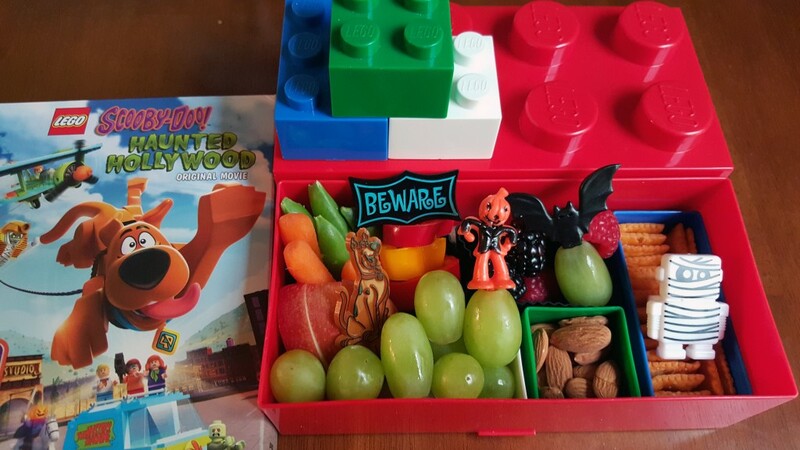 She has carrots, sugar snap peas, sweet pepper rings on a “Beware” pick, blackberries, raspberries, a couple of apple slices with a Scooby-Doo pick, and whole bunch of green grapes. I included the pumpkin head pick and bat picks to represent the “haunted” aspects of the movie. 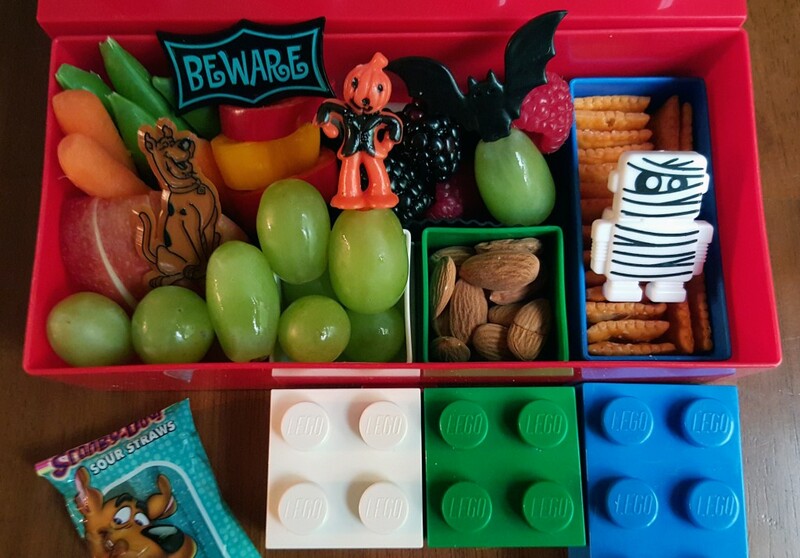 In the little Lego block containers, she has almonds, and crackers with a mummy ring to represent one of the movie characters. 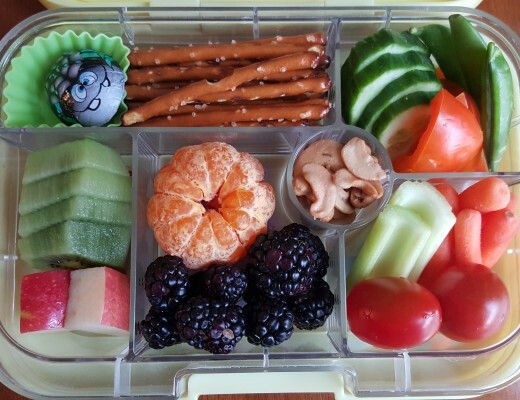 A string cheese is also tucked in behind the fruits and veggies. The picture above shows a closer view of some of the picks. The Scooby-Doo and pumpkin-head guy are vintage picks from the Mothergoose Collectibles shop on eBay. The mummy ring is from this Halloween robot set. In the picture above, you can see the tops for the little containers I used inside the bigger red box. These are handy for keeping crackers crispy and for helping to keep the foods separated. 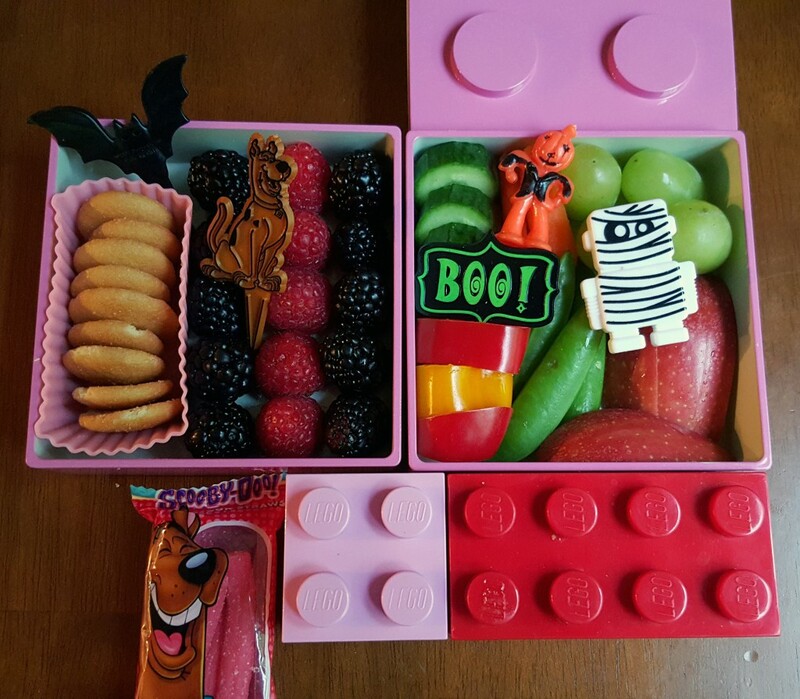 I packed my son’s lunch in our two tier pink Lego block box (sort of like this one) because it will be easier for him to open. One tier has mini vanilla wafers, blackberries, and raspberries. The other tier holds cucumber slices, pepper rings on a “Boo!” pick, green grapes, sugar snap peas, and apple slices. The red container holds his crackers and the small pink container is filled with almonds. 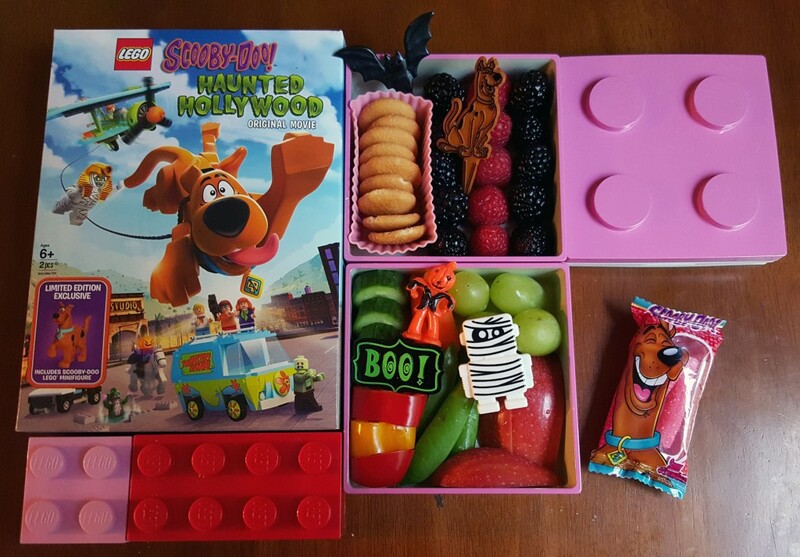 I also included a little package of Scooby-Doo! Sour Straws with both kids’ lunches. 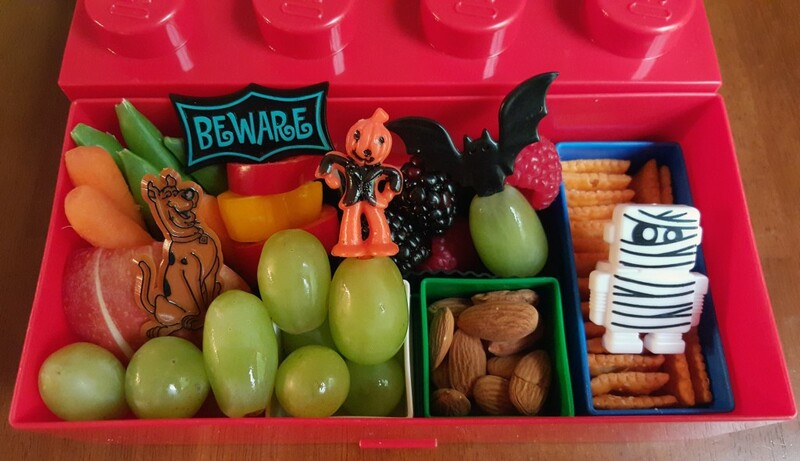 My son and my daughter enjoyed the movie and they were pretty impressed that their mom had the pumpkin head man and other coordinating accessories on hand to make these lunches. My son declared it Lego night and continued the fun by building with Legos and reading some Lego City books before bed.